Republican U.S. Rep. Lou Barletta, left, and Democratic incumbent U.S. Senator Bob Casey Jr., right. With Casey pointing to a lawsuit set to dismantle the ACA, and Barletta accusing Casey of personal attack ads, the discussion around health care is heating up. From the outside, Alfredo’s Pizza & Restaurant is little more than a neon sign on the face of a nondescript shopping center in Scranton. Evergreen shrubs block people dining on the patio from a view of shoppers walking into the Dollar Tree next door. Inside, on a Tuesday evening in October, it was a scene you’d only see during the weeks leading up to an election: Republican U.S. Rep. Lou Barletta in a room packed with supporters as he seeks to unseat Democratic incumbent U.S. 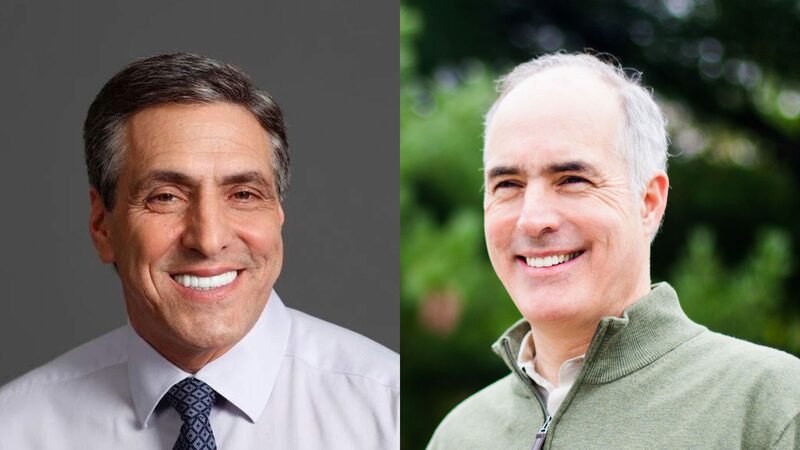 Senator Bob Casey, Jr.
Barletta has supported President Donald Trump since before the election, when supporting Trump seemed like a risky long-shot to some Republicans. For Barletta, who said a phone call from Trump is what spurred him to run for senate, dismantling the Affordable Care Act is one cornerstone of a platform closely allied with the president. Speaking to the enthusiastic crowd, Barletta focused on those ties, and borrowed Trump’s language. 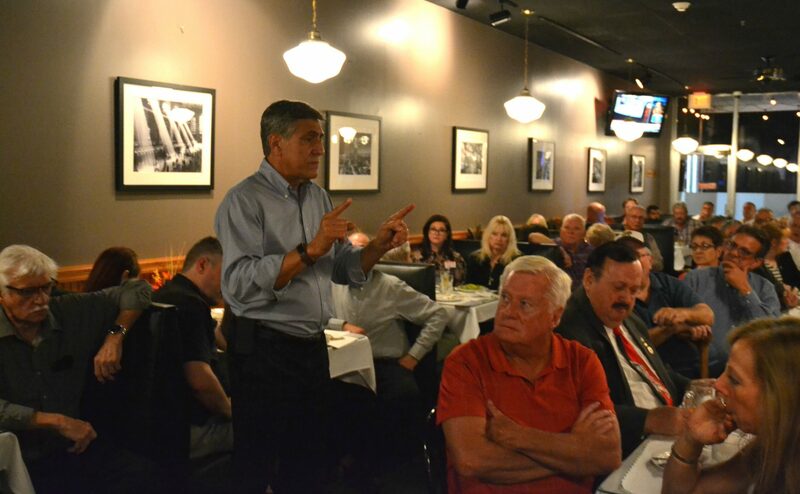 Republican U.S. Rep. Lou Barletta speaks to supporters at Alfredo’s Pizza & Restaurant in Scranton, Lackawanna County, Tuesday, Oct. 9, 2018. To Barletta, like some of his supporters at Alfredo’s, a conversation about health care is inherently a conversation about costs. Aggregate ACA premiums went up 114 percent since 2014, according to the Pennsylvania Department of Insurance, and Barletta pointed to that. “Your deductible is so high that people stop going to the doctor. They can’t afford to pay the deductible,” Barletta said during an interview at the event. Barletta, as he regularly does, spoke to one of the two aspects of the ACA that have made it a complex issue for Republicans and Democrats alike. One on hand, even some Democrats have shown unease with the cost of the plans, especially since the individual mandate required people to get insurance or pay a tax. On the other hand, even some Republicans have been uneasy about losing the protection for pre-existing conditions under the ACA. It’s the second point that has Casey on the offensive. The two-term senator recently endorsed a political advertisement featuring Stacie Ritter from Manheim, Lancaster County. In the ad, Ritter tells the same story she’s been telling since at least 2010, when she testified to Democratic U.S. Rep. Mike Doyle. Ritter’s twin daughters were diagnosed with cancer when they were 4 years old. In the years since, she’s become an advocate for progressive health care causes. This time, the two campaigns tangled over the ad. In a response to it on Facebook Live, Barletta said it was a shameful personal attack, coming just months after Barletta learned his 18-month-old grandson, who is also a twin, has cancer. Casey’s campaign had the ad removed from the Scranton media market, near Barletta’s home. But to Casey’s point: Barletta, along with many other Republicans, did vote to repeal the ACA. That move that would have nixed protections for pre-existing conditions, although in theory Republicans might have reintroduced those protections as part of the “replace” Obamacare effort. Casey didn’t immediately have any campaign stops planned, but he was available for a phone interview. He said the vote to repeal the ACA was just the beginning of Republican efforts to return health insurance to the days when an illness could keep people from getting covered. That move paved the way for Republicans to file a lawsuit in September in federal district court in Texas, Casey said. 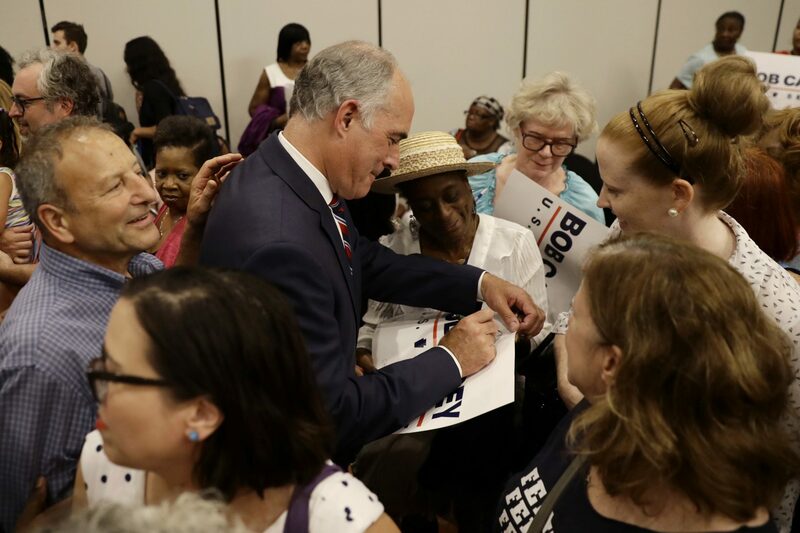 Sen. Bob Casey, D-Pa., greets supporters after a general election campaign event with Sen. Kamala Harris, D-Calif., Friday, July 13, 2018, in Philadelphia. Casey is seeking a third term in November’s election and is being challenged by Republican U.S. Rep. Lou Barletta of northeastern Pennsylvania. That lawsuit, Texas vs. United States, asserts the Affordable Care Act is unconstitutional, and therefore should be thrown out. If the ACA is thrown out, it stands to reason that protections for those with pre-existing conditions will be thrown out as well, said Dan Mallinson, Assistant Professor of Public Policy and Administration at Penn State Harrisburg, in a telephone interview. “I think this is why Republicans are a little bit back on their heels recently with this critique, or this campaign issue about specifically pre-existing conditions,” Mallinson said. While Republicans don’t want to be on the hook for rolling back protection for pre-existing conditions, Democrats are still dealing with the issue of high premiums and deductibles — a problem they haven’t quite been able to fix, Mallinson said. Either way, Barletta is fighting his own battle, and despite the energy of supporters in places like Scranton, it’s an uphill one. Casey raised $2.2 million in the third quarter of the 2018 campaign and has $6.7 million available. Barletta also raised $2.2 million that quarter, but has only $1.3 million on-hand. Recent independent polls show Casey with a more-than 15 point lead. Mallinson acknowledged that Republican voters may be energized by the Brett Kavanaugh nomination.